The first edition of Manhattan Transfer was formed in 1969 by Gene Pistilli, Tim Hauser, Erin Dickins, Marty Nelson, and Pat Rosalia, splitting after one album. Hauser reformed the band in 1972 and, with Janis Siegel, Laurel Masse, and Alan Paul, established the group in New York, playing several club dates. The Manhattan Transfer (Atlantic, 1975), on which they used jazz musicians including Zoot Sims, was a success, but they moved away from jazz after that to seek a more contemporary field in pop, country, and R&B. Masse left in 1979 and was replaced by Cheryl Bentyne, this third edition of the group winning critical and popular acclaim with Extensions (Atlantic, 1979), which contained their unforgettable interpretation of Joe Zawinul's "Birdland." But perhaps their greatest contribution was Vocalese (Atlantic, 1985), on which they brought the art form back into the limelight. Their last album of original material came with Vibrate (Telarc, 2004), and the band comes full circle, now, with The Chick Corea Songbook, a fine way of celebrating their 40th anniversary. Piano icon Chick Corea's music is complex. Determining the changes and putting them in perspective is challenging, but Manhattan Transfer has captured the magic, singing with a captivating balance of charm and verve. Their harmonies are still impeccable and, while key to the overall impact, the solo voice also contributes to the soul of the music. Corea wrote the snappy opener, "Free Samba," especially for this CD and plays the Yamaha Motif XS8. The singing is vibrant and Corea rips into a funky beat letting the intensity ride high. They revisit the tune at the disc's end, extending the gambit and changing the contours by flexing the tempo and the rhythmic pattern. "The Story of Anna & Armando (Armando's Rhumba)" is flamboyant, the vocals swaying and resounding in harmony within the balmy atmosphere of the lyrics. Percussion and horns drive the pulse as the trumpets of Robert Rodriguez and Mike Pinella smear the palette and Edsel Gomez adds lyrical ideas on the piano. "Spain" is magical. The snap and crackle are done to a nicety, the arrangement opening the door to gently cascading harmonies and embracing solo singing. Quite in contrast is the ballad "Time's Lie" arranged by Fred Hersch, where the pianist brings the lead voice up front, using the rest as a velvet backdrop. Another factor that contributes to the development of each track is in the use of the musicians. Several combinations accompany Manhattan Transfer, which takes the whole to a higher level of accomplishment. 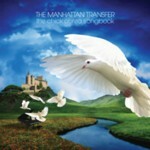 Manhattan Transfer is back, and in top-notch form with a marvelous blend of melody and song. Track Listing: Free Samba; Prelude; Spain (I Can Recall); One Step Closer (The One step); Children's Song #15; 500 Miles High; Another Roadside Attraction (Space Circus); Time's Lie; La Chanson Du Bebe (Children's Song #1); Ragtime in Pixiland (Pixiland Rag); The Story of Anna & Armando (Armando's Rhumba); Free Samba (Extended version). Personnel: Tim Hauser: vocals; Janis Siegel: vocals; Alan Paul: vocals; Cheryl Bentyne: vocals; Chick Corea: Yamaha Motif XS8; Yaron Gershovsky: Fender Rhodes, programming; Gary Wicks: electric bass; Steve Hass: drums; Alex Acuna: percussion; Fred Hersch: piano; John Hebert: acoustic bass; Billy Drummond: drums; John Benitez: electric bass; Vince Cherico: drums; Mike Pinella: trumpet; Robert Rodriguez: trumpet; Conrad Herwig: trombone; Ronnie Cuber: baritone sax; Luisito Quintero: percussion, congas, timbales; Bais Haus: synthesizer, drum programming; Christian McBride: acoustic bass; Joe Passaro: marimba; Lou Marni: flute, alto flute; Ramon Stagnero: acoustic guitar.